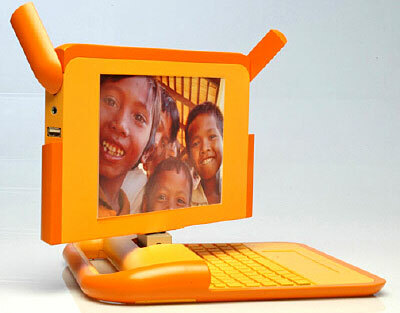 Nicholas Negroponte of MIT's Media Lab showed off the latest version of his $100 OLPC (One Laptop Per Child), the Linux-based laptop that will begin shipping to developing countries starting in April, 2007. The 2-pound laptop won't cost $100, though. Its price will actually be between $130 and $140 not including shipping, but Negroponte expects that $100 price point to be reached by the end of 2008 when manufacturing has scaled up to 5 to 6 million units. Negroponte added that pricing depends on how much RAM is installed in the low-cost PCs, but another key element in the unit's pricing is its sunlight-readable display, which he said won't be done until August or September. Seven countries are showing interest in the PC, with Nigeria, Brazil, Thailand and Argentina most interested in the concept. How does the cheap laptop run? According to Negroponte, "Like a bat out of hell." In that case, we want one, too.